DID AN UNDERSEA EARTHQUAKE CAUSE PILOT WHALES TO BEACH NEAR NAPLES FLORIDA? 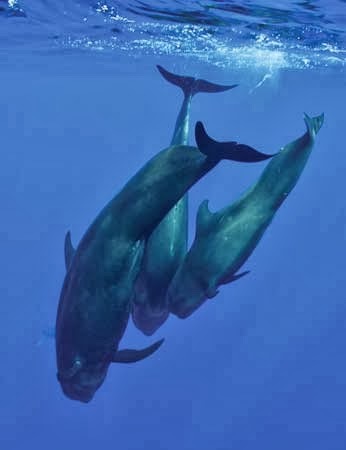 Thirty-nine short-finned pilot whale were spotted swimming near shore Just off Naples; 33 carcasses were found. Six were likely taken by sharks. Mass beachings have been going on for millions of years; any acceptable answer must account for this long time span and explain ALL the repeat observations in the stranding area. The THE SEAQUAKE SOLUTION is the only concept that accounts for the long history and also explains all the consistent observation. At 12:45 PM local time, on 23 December 2013, a whale-dangerous submarine earthquake occurred in the North Atlantic inside a known habitat for short-finned pilot whales. The epicenter was located ~850 miles east of Miami, Florida and ~500 miles north of San Juan, Puerto Rico at 25.70 N ; 66.70 W.
The dancing seafloor generated changes in diving pressures that could have caused a barotraumatic injury in every whale within 30 miles in all directions. There was a second dangerous earthquake (4.8 M) along the Mid-Atlantic Ridge on 21 November 2013. Picking the exact event hinges more on the general condition of the pod when they arrived at Naples. Blair Mase, NOAA stranding expert, said, "Some of the whales looked emaciated, and some appeared to be in decent condition." There's no explanation for why some of the dead from the same pod were in decent condition while others were not. If they were emaciated, the 21 November event is more likely. Both events are about the same distance upstream (3,600 miles) from Naples, Florida. In the November event, the pod traveled downstream for 60 days covering ~60 miles per day (half the average speed). In the December event, the pod was out 29 days and would have had to traveled downstream ~125 miles per day. Both time frames are possible depending on the flow and speed of surface currents. Non-navigating whales can be drawn into a current eddie and swim in circles for several weeks. Eddies often form in the Loop Current that runs just off Naples. Besides earthquakes, these whales might have been injured by US Navy sonar, oil industry airguns, undersea explosions, volcanic eruptions, or the violent impact of a heavenly body with the water's surface. All of these sources generate a series of powerful pressure changes that could induce a deadly barotrauma in their cranial air spaces called barosinusitis. Getting caught by surprise in a field of rapid and excessive pressure changes during a dive is every diver's worst nightmare come true. Furthermore, because the air contained in their cranial air spaces serves underwater as acoustic mirrors, bouncing sound around in their head in a fashion to make their biosonar function, sinus barotrauma not only prevents diving and feeding, it also knocks out their echonavigation abilities and the whales instantly lose their sense of direction. Whales suffering from barosinusitis can not navigate or dive or feed themselves. This is why they swim blindly into a shallow water trap with nothing in their stomachs. The December event was epicentered in the upper left of the chart below. These charts depict the average surface flow over 20 years; it does not show the actual currents on the days in question. If you look closely you will see that the non-navigating pilot whales would have been guided east with the surface flow towards 45 degrees west (above the Mid-Atlantic Ridge where the second quake took place). Somewhere near 40 degrees west, the surface currents usually turn south and then swing southwest. This would have guided the whales into the Caribbean Sea. Since the whales were swimming in the downstream path of least drag, they would have slowly migrated into the fastest western flow, which would have guided them south of Jamaica and the Cayman Islands. The pod would have traveled close to Honduras and approached to within 300 miles east of Belize before being carried north by strong surface flow. They would have then passed through the Yucatan Channel and entered the Loop Current feeding into the Gulf of Mexico (GOM). Once inside the Gulf, strong shoreward winds would have shifted the surface currents towards Naples and Ft. Meyers. It was likely the strong winds offshore of Naples that kicked up the sea during a dark night and split the pod into two groups. Once they got separated, they could not find their way back to the main pod because their biosonar was not working. Eight died near Ft. Meyers; ~6 are missing and assumed dead. The 25 that escaped from Gordon's Pass were found dead 23 January on Kice Island, ~16 miles south of Naples. Blair Mase, NOAA's marine mammal stranding coordinator said, "A major cold front came through, and it's suspected the animals pushed ashore at that time." What Blair is saying is that a front, with 15 to 20 knot west (shoreward) winds set the surface currents flowing towards the beach, guiding the 25 non-navigating, dying whales into the sand. Blare Mase told another group of reporters that, "Swimming inland is often a sign they are suffering from some kind of poisoning or disease." Her statements are misleading. If the shoreward wind, kicked up by the cold front, washed the whales into the shore, it is not a sign of disease or poisoning. Rather, being directed ashore by a current is a sign that the were lost and had no sense of direction. When whales have lost their ability to echonavigate, they always swim DOWNSTREAM in the path of least drag. If their biosonar was working they would have echo-navigated away out of the shallow water and away from the beach. In fact, if they had had a sense of direction as they approached Ft. Meyers/Naples, they would never have entered the backwater bays and lagoons in the first place. They would still be safe and sound in their deep water habitat. Furthermore, apparently NOAA considers it impossible for the most prolific divers on Earth to have been injured while on a feeding dive by intense changes in the surrounding water pressure generated by military sonar, an explosion, an array of seismic airguns, the violent impact of a heavenly body with the surface of the sea, a sudden volcanic explosion, or seismic sea waves generated above the epicenter of an undersea earthquake. Earthquakes have been ongoing in the ocean environment of whales for millions of years. Why does NOAA and all the whale scientists ignore seaquakes? Even if you are the biggest dummy in the entire world, you must admit that there is a chance that exposure to powerful disturbances in diving pressures induced above the epicenter of a shallow-focused thrusting earthquake might cause injury in the world's most prolific divers. This is not rocket science... undersea earthquakes generate whale dangerous hydroacoustic pressure changes that can blow out the sinuses of an entire pod of diving whales. The air in these sinuses serves underwater as acoustic mirrors; if the whale suffers a barotraumatic sinus injury, it loses its acoustic sense of direction. An animal injured in such a fashion can not navigate and can not dive and feed itself. Once they lose their sense of direction, they swim downstream with the flow of the current. The current is the energy that builds beaches so it is only natural that currents carry non-navigating whales to beaches. Or, in this case, into backwater areas on the incoming tide. 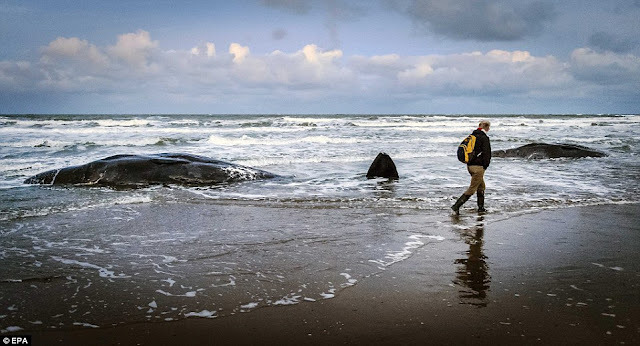 Back to the cover-up question... if there is no effort by our governments to cover-up the real cause of whale beachings, then why don't NOAA and the scientific community conduct research to show that earthquakes are not the answer. There has never been any research into natural underwater catastrophes and whale beachings. Why are they mute on the possibility that a natural upheaval on the seafloor can injure whales? Barotraumatic injuries in the sinuses and air sacs of whales prevent diving and feeding and navigating (that's why their stomachs are empty and they are often thin and emaciated). But you will never hear Blare Mase talk about pressure-related diving injuries. I looked into the typhoon that hit Tonga. The only connection I could make is that it might has stirred the winds somewhat and increased the surface currents inside Golden Bay. I don't buy the idea that whales are attracted to some sort of man made gridline because this concept ignores the fact that they are dehydrated and have no food in their stomach when they do aground. One has to account for all the consistent observations. There is evidence that they have a geomagnetic sense. I think they use it to detect pending earthquakes because they always seem to avoid being near where strong/major events erupt. Instead, they get surprised by quakes between 4.5 and 6 magnitude. I suspect this might be because the lesser quakes often occur without advance precursors, especially along mid-ocean ridges. There was work done in the 1980s showing that pod strandings tended to occurred where geomagnetic minimums crossed the beach. I just couldn't see the whales using the minimum signals as a navigation tool. Then it dawned on me that they were not follow minimums, they were avoiding maximums since maximums represented pending earthquakes. Earthquake detection by whales is a fascinating topic. I am uncovering lost of evidence to support such an idea.